Many people have a hard time identifying black mold, simply because they don't know exactly what to look for. But, you can learn a few steps for black mold identification to detect if there is a mold problem in your home. The easiest way to identify black mold is when you can visibly see it growing on a porous surface. Unfortunately the earlier stages of mold are not very easy to identify. In fact, mold can be present on surfaces and in the air without being noticeable, because the mold spores are microscopic and thus cannot be seen with the naked eye. The most common places to find black mold are damp; check areas such as the bathroom, basement, or areas with leaky pipes. 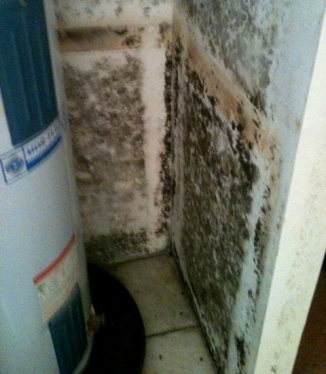 Other areas within a home that may cause mold growth include water beds, fish tanks, leaky washing machines, or windows with condensation inside. If you live in a humid area, then the mold may begin to grow in many places within the building, and any porous surface may be affected. If you are working on identifying black mold, keep in mind that the mold spores can spread easily throughout the rest of the building. For example, even though black mold may only have been identified in a small portion of your home, it has likely that spores have spread to other areas of the room and even into other areas of the home through the ventilation system. It is also important to note that black mold can easily be spread if you try to clean up the mold without following the right steps. Some homeowners make the mistake of identifying black mold on their own, and then attempting to clean it up without doing it correctly. During this improper cleanup process, the mold spores may become airborne and move through the HVAC system of the home... spreading and contaminating other areas of the home. So, if you attempt black mold identification by yourself, be sure that you completely understand the processes that needs to be followed in order to prevent cross contamination. Be very cautious, because a mold problem can be extremely dangerous to the health of anyone who comes in contact with mold spores. Below is a picture of black mold that was found in the basement of a house, in the hot water heater closet. There are at-home mold identification kits that can be purchased, and these claim that they are accurate at identifying black mold. But, the truth is that these kits are sub-par compared to the high end testing equipment that mold specialists use. The best source of black mold identification is by working with a professional who can test before and after the cleanup process. To be safe, it is best to work with two different mold companies: one to do the testing, and another to do the cleanup. This way you have a qualified professional verifying that the cleanup was done correctly. Professional black mold testing will be able to test specific surfaces in your home, and they also have the tools available to identify whether the mold has spread into the ventilation system of the building. This second test is very important, because if you clean up a section of black mold without cleaning out the HVAC system, then the mold may grow back. Sometimes this re-growth will appear in the same location, but it can also grow in a different part of the home since it is moving through the vents. Use this link to locate a professional to test for mold in your home. 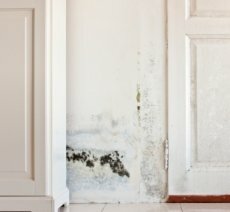 Expect a professional to visit your home, conduct tests for mold in several different locations, inform you about which types of mold are present, educate you about the specific risks of exposure to those types of mold, and provide you with a safety protocol for handling the removal of the mold. A professional should also return to your home to retest for mold after the cleanup to make sure all mold was removed. Use this link to locate a professional to handle the mold cleanup. Expect a professional to offer a free consultation which includes an inspection of your home and a detailed plan for cleaning up the mold in your home. Even if you opt to handle the cleanup yourself, you can gain valuable information and advice from a free consultation with a professional. Black mold on a wall that was caused by a leaky pipe in the bathroom behind the wall.